You've heard of the indestructible "black boxes" on airplanes? This is the bucket version of that strength. Every household should have at least one. Made of incredible tough high-density polyethylene plastic, it's designed to withstand daily abuse and extreme weather while handling just about any indoor or outdoor job you can imagine, from cleaning and mopping to hauling and storing. Huge bucket! Really sturdy and well made, but larger than I expected. 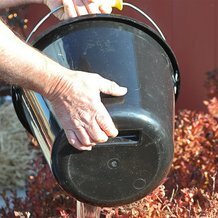 It is shorter with a wider opening, when compared to a standard 5-gallon bucket, and it holds a lot! The handle is comfortable and designed to rotate freely, and the bottom grip opposite the pouring spout is a great feature. I would love to see them offer the same design in a 2-gallon size for household cleaning chores. 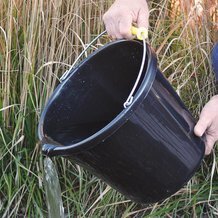 But if you need a large bucket, this is the nicest I have ever seen.